Suffragists voting in New York, 1917. An article originally published in the 1991 Session Weekly of the Minnesota House of Representatives recalls the arguments put forth in objection to the Minnesota Equal Suffrage Association's decision, early in the 20th century, to push for the right of women to vote in presidential elections. One lawmaker declared that all-male voting was "designed by our forefathers." Later, Rep. Thomas Girling argued that "women shouldn't be dragged into the dirty pool of politics." Approving such a measure, he said, would "cause irreparable damage at great expense to the state." When the Senate took up the bill, one member asserted that "disaster and ruin would overtake the nation." Suffrage would lead inevitably to "government by females" because "men could never resist the blandishments of women." Instead, he recommended that women "attach themselves to some man who will represent them in public affairs." Though such arguments may now sound rather ridiculous to some, they are closely related to entrenched views of women that took more than a century to overcome (assuming one agrees they have been overcome). Understanding the positions of the suffrage and anti-suffrage movements—as expressed in archival broadsides, speeches, pamphlets, and political cartoons—will help your students better appreciate the struggle for women's rights and the vestiges of the anti-suffrage positions that lasted at least through the 1960s and, perhaps, to the present day. Note: This lesson may be taught either as a stand-alone lesson or as a companion to the complementary EDSITEment lessons Women's Suffrage: Why the West First, Who were the Foremothers of Women's Equality?, and Women's Equality: Changing Attitudes and Beliefs. Download the Pro- and Anti-Suffrage Worksheet, available here as a PDF. Print out and make an appropriate number of copies of any handouts you plan to use in class. Who Were the Foremothers of Women's Equality? : Students encounter major figures in the woman's rights movement of the 19th and early 20th centuries in important documents and other primary and secondary materials. The first activity in particular familiarizes students with the formative goals of the movement as voiced in Elizabeth Cady Stanton's 1848 "Declaration of Sentiments." 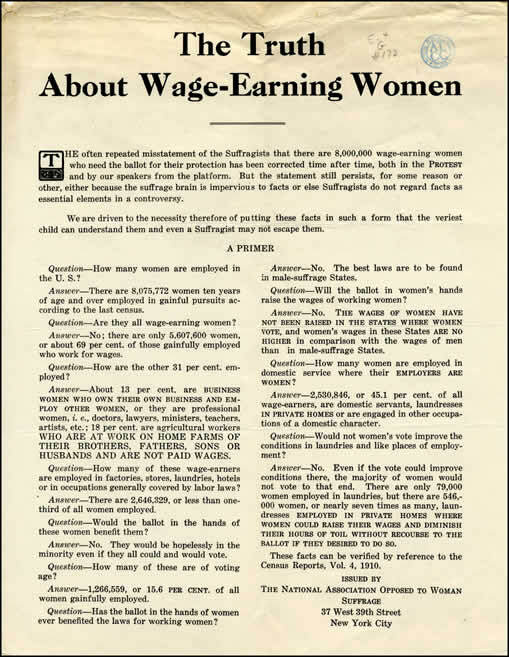 Women's Equality: Changing Attitudes and Beliefs: Students analyze archival cartoons, posters, magazine humor, newspaper articles and poems that reflect the deeply entrenched attitudes and beliefs the early crusaders for women's rights had to overcome. Women's Suffrage: Why the West First? : Students compile information to examine hypotheses explaining why the first nine states to grant full voting rights for women were located in the West. All four initial grievances relate to the exclusion of women from the voting process, the overt subject of the first grievance. The second grievance echoes a familiar cry from the American Revolution, "No taxation without representation." The third grievance is a precursor to the argument used in the courts starting in the 1870s, that if women are citizens, they cannot be deprived of rights accorded to other citizens (and even, in some instances, non-citizens). The fourth grievance explains why the early proponents of the Women's Rights Movement chose suffrage as their central goal. Depriving women "of the elective franchise" made "oppressions… on all sides" possible. Stanton continues by listing many such oppressions. For further background on the suffrage and anti-suffrage movements, consult Not For Ourselves Alone, a link from the EDSITEment-reviewed website New Perspectives on the West. The Currier and Ives lithograph The Age of Brass/or the Triumphs of Women's Rights (from the Library of Congress), used in Activity 1, is from 1869. According to Roland Marchand, it is a picture of various types of dangerous feminists. It includes the following words and phrases: "Vote for the Celebrated Man Tamer / Susan Sharp Tongue"; "Rights for Women … for Sheriff Miss Hang Man …" It also features two women smoking cigars and, to the side, a man with a baby. An additional EDSITEment lesson, Cultural Change, explains how women won the vote and explores the relationship between political ideas and cultural attitudes. For further reading, consult the Recommended Reading List provided here as a PDF. Activity 1. The Triumph of Women's Rights? To establish an anticipatory set, begin by sharing with students the Currier and Ives lithograph The Age of Brass/or the Triumphs of Women's Rights, available from the Library of Congress. Before giving any background or guidance, encourage students to report what they notice in the lithograph. Then, in a whole-class setting, use this Cartoon Analysis Worksheet (offered by the Educator Resources section of National Archives) to analyze the illustration. Tell students they will be much better equipped to do such analyses when they have completed the other activities in this lesson. Share with students the first paragraph of the Introduction, above. Was the legislator correct when he said that all-male voting was "designed by our forefathers?" As a class, read the 19th Amendment to the U.S. Constitution (ratified 1920), available in a Transcript of Amendments 11-27 from the National Archives. What does the amendment say? Now have students scan the text of the Constitution. (A Transcription of the U.S. Constitution is also available from the National Archives.) Are women expressly forbidden from voting? Why was the 19th Amendment necessary? Women did vote in some states in the early days of our republic. Share with students the document 1797, An Act to regulate the election of members of the legislative council and general assembly, sheriffs and coroners, in this State, available courtesy of Rutgers University Libraries via New Jersey Women's History. What does the document indicate about voting in the state of New Jersey? (Women did vote.) Nevertheless, later acts rescinded the right of suffrage for women in every state—share with students the document Who Shall Not Vote 1807, also available courtesy of Rutgers University Libraries via New Jersey Women's History. Though passed in hopes of enforcing the rights of freed slaves to vote, a less well-known act of Congress—the Enforcement Act of 1870—was used to convict Elizabeth Cady Stanton of voting illegally. Download, copy and distribute to students the "Enforcement Act of 1870" on page 1 of the Pro-and Anti-Suffrage Worksheet, available here as a PDF. Can students find the clause that was used against Stanton? The Founding Fathers never specifically banned women from voting, but the states did have that power and used it. What we might call a technicality in the Federal law was also used to enforce the ban. If desired, students can now fill in the first section of the chart "Pro- and Anti-Suffrage Arguments" on page 2 of the PDF. Share with the class the document A Petition for Universal Suffrage (circa 1865), an early plea to Congress, available from the National Archives. What are some of the issues Stanton, Anthony, Blackwell, Stone, and others included in the petition? If you have not already done so, pass out the chart "Pro- and Anti-Suffrage Arguments," on page 2 of the PDF (see Preparing to Teach This Lesson), for students to use during the following activity. Divide the class into eight groups. The archival documents listed below will allow the groups to explore specific issues. The selected documents have a common theme or themes, but are not necessarily limited to any particular theme. If possible, create overheads or multiple copies of documents as requested by groups. Group 5: Are Women Already Represented? Group 6: Do Women Even Want the Vote? Group 7: Will Suffrage Ruin Marriage, the Family, and the Nation? Following their research, student groups should present their documents in a point/counterpoint fashion, having at least two speakers—each of whom represents a position as expressed in a particular document—speak in turn when possible. Once again, show students The Age of Brass/or the Triumphs of Women's Rights (from the Library of Congress). Would students analyze it differently now than they did when this lesson began? Students can use the Cartoon Analysis Worksheet, available via the Educator Resources section of the National Archives website, for guidance. Many of the early activists for women's rights became politicized through their interest in abolition. In an 1837 letter to Catherine E. Beecher, Angelina Emily Grimke, an early leader in the movement, explained how her interests expanded from antislavery to women's rights. If desired, you can bring the discussion of the issues in Part 3 and Part 4, above, into more contemporary times. Share with the class the speech by Shirley Chisholm: "Equal Rights for Women" (available on the EDSITEment-reviewed website African-American Women: Online Archival Collection), presented in the House of Representatives on May 21, 1969. Which issues from the previous discussion did she raise? What new issues did she raise? Share the first four pages of the illustrated satirical poem from the 1960s "There Was a Young Woman Who Swallowed a Lie" by Meridith Tax, also available on the EDSITEment resource African-American Women: Online Archival Collection. Which issues from the previous discussion did she raise? What new issues did she raise? Students compile information to examine hypotheses explaining why the first nine states to grant full voting rights for women were located in the West. What attitudes about women and their relationships with men had to be overcome before women could take their rightful place in American society? What were the arguments for and against suffrage?